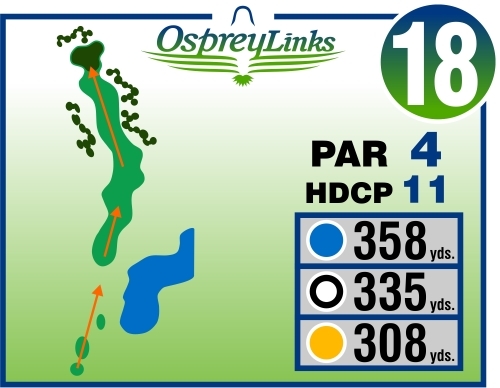 The Eighteenth Hole is a great finishing hole, partially uphill and with a slight dog leg left. Probably lots of room to hit a driver, and for the really big hitters rolling inside the 100 yard marker for your second shot is not unheard of. But beware, from the 200 yard marker in, the hole is uphill and the green is both slightly elevated and tiered. And it’s also not unheard of to drive through the fairway on the right an find yourself behind a tree … or worse!